How Kubo and the Two Strings became the first animated movie in 24 years to be nominated for Best Visual Effects. 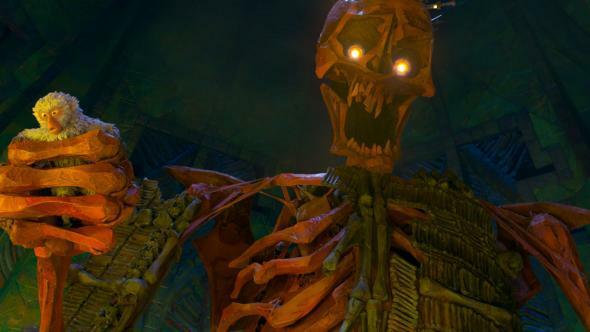 Among the cool effects in Kubo: the 11-foot-tall skeleton, the largest stop-motion puppet ever made. One of the nicer surprises of Tuesday’s Oscar nominations was a second nomination for the gorgeous animated feature Kubo and the Two Strings. Laika’s combination stop-motion and computer-animated film landed, as expected, in Best Animated Feature, but it also joined the nominees for Best Visual Effects. It’s the first animated movie to place in that category since 1993’s The Nightmare Before Christmas. Naysayers might doubt it has a place among such effects extravaganzas as Rogue One and The Jungle Book, but Kubo’s nomination is well-earned. And it may have landed that nod thanks to a secret weapon that no other film under consideration possessed. At that point, it’s about iterating, adding style, figuring out everything from churn to spray to white caps. For every element that would eventually make up that water system, each had to be designed ultimately to suit the style of the film and feel like they belonged in Kubo’s world. Also, for all of those elements, we needed physical reference. So the art department created water churn for us out of paper and showed us what that looked like. We’d take an element like that and again, create another photorealistic interpretation and fold that into our water system until we finally landed on something that felt different, that felt like it belonged in that world, that was exciting and distinctive. While some of the film’s VFX team were out on a stage rippling garbage bags, others were finalizing a complex 3-D printing system that has revolutionized the way characters are created in stop-motion animation. Laika’s “rapid prototyping” process allows the company to quickly 3-D–print complicated facial expressions for its characters, allowing Kubo and the other characters to feel far more emotionally expressive than stop-motion characters typically do. The academy has already announced that Laika staffers will receive Scientific and Technical Awards for the rapid prototyping process. But noncompetition awards often replace official nominations for outside-the-box films. (Witness John Lasseter’s “special achievement award” for 1995’s Toy Story, in lieu of Visual Effects or Best Director nominations.) How did Laika convince Oscar voters that an animated film deserved a spot in a traditionally nonanimated category? Over at IndieWire, Bill Desowitz points to the film’s terrific showing in the academy’s early-January “bake-off,” in which the 10 finalists for nominations present short highlight reels of shots from their films and explain the challenges and innovations involved. Kubo, through luck of the draw, went last at the bake-off, which may have helped, but the movie’s real secret weapon was the “making-of” footage that accompanied the film’s theatrical credits. That meant that, unlike every other finalist, Kubo’s bake-off presentation included behind-the-scenes shots of the film’s VFX artists making magic on screen. Hats off to the academy’s visual-effects branch for recognizing artistry and innovation in an unexpected place. Here’s hoping other branches follow suit. Indeed, Kubo likely came close to breaking another barrier this year: The film’s remarkable costumes, designed by Deborah Cook, were nominated for a Costume Designers Guild Award, a first for an animated film.